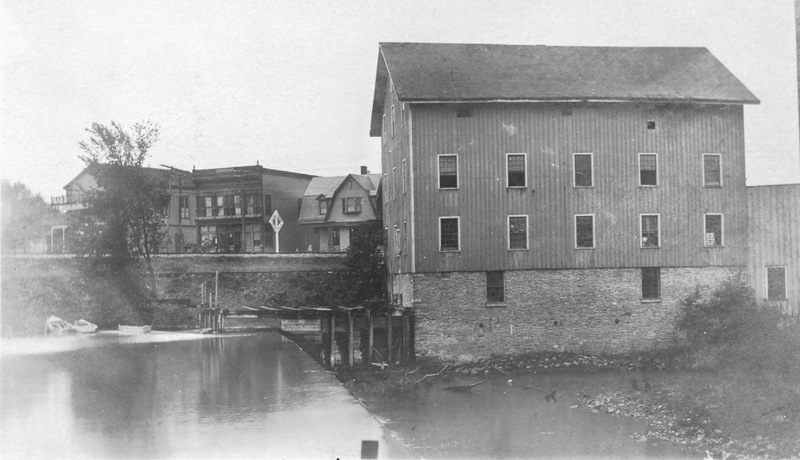 View of the Rush Mill on the bank of the Honeoye Creek in the hamlet of East Rush. View is facing south west. Rush celebrated its bicentennial anniversary in 2018. Here is a Printable Year Long Bicentennial Calendar. The Town of Rush was founded in 1818. Prior to that, it was part of Hartford which is now Avon, NY. The northern portion of Hartford broke away to form the Township of Rush and was officially established as a town by the New York State legislature on March 13, 1818. Monroe County had not yet been formed, so Rush was originally part of Ontario County. In February of 1821, Monroe County was formed and Rush became part of Monroe County. The origin of the name of the Town is uncertain. Three possible theories have been considered: one, the town was named for the large quantity of rushes growing on the flats and which were used to feed the cattle of the early settlers; two, the town was named for Dr. Benjamin Rush, Surgeon General to the Continental Army during the American Revolution, a member of the first Continental Congress, and a signer of the Declaration of Independence; or three, named for Richard Rush, son of Dr. Benjamin Rush. Richard Rush was an American statesman and diplomat, and served as attorney general in President James Madison’s administration. To date, no documentation has been discovered to clearly identify which of these theories might be the actual namesake but general consensus leans toward the Town being named after Dr. Benjamin Rush. Office Hours: Mondays: 8:30-10:30 am; Thursdays: 5:30-7:30. It is advisable to contact in advance due to schedule changes and commitments within the community. Also available by appointment at other times. The oil company was Rush Oil and Supply Company and was owned by William Klick, George Sherman and H. Grad Diver. Since Rush Oil closed, the building has been home to Jones Chemical, a liquor store, and is currently Montesano’s Pizzeria. Construction for the LVRR in Rush began in 1890 and opened in 1892. The first train occurred in 1892, just four days after its opening in Rush. The cause of that wreck was said to have been due to the poorly settled road bad. The engine slid down the embankment into the creek and the train engineer died in the accident. The second derailment occurred immediately following the Memorial Day parade in 1967. Then, in 1974, the third derailment took place. This accident resulted in 10,000 gallons of oil being spilled into the creek. All three train wrecks occurred in nearly the same place and it was said that the trains would bounce and sway at the road crossing resulting in their derailment. Hi, The Rush Oil Company building was occupied by Al-Don Chemical Company, my mother worked there and I worked there for a short time. When they left there they moved to East Avon..
Did the town of Rush play any role in the Civil War? I found a cousin who is registered in the 1863 Civil War draft in Pennsylvania but then find him and his mother in Rush in 1865. Was he a “draft dodger” hiding out? Or was there a camp there and his mother went along with him? There was not a camp in the town of Rush but there were camps nearby in the City of Rochester as well as towns further south of Rush. There were more than a hundred young men from Rush who served in the Civil War. I wonder if your ancestor had relatives in Rush. What was his name? Do you also know his mother’s maiden name?